In Alain Platel, Frank Van Laecke and Steven Prengel’s En Avant, Marche!, Wim Opbrouck plays a former trombonist (now reluctant percussionist) struggling to come to terms with a terminal illness. In the rehearsal room he turns on a cassette player and carefully awaits his turn to strike the cymbals – then hits fast forward. Opbrouck is larger than life, a protagonist you immediately warm to. 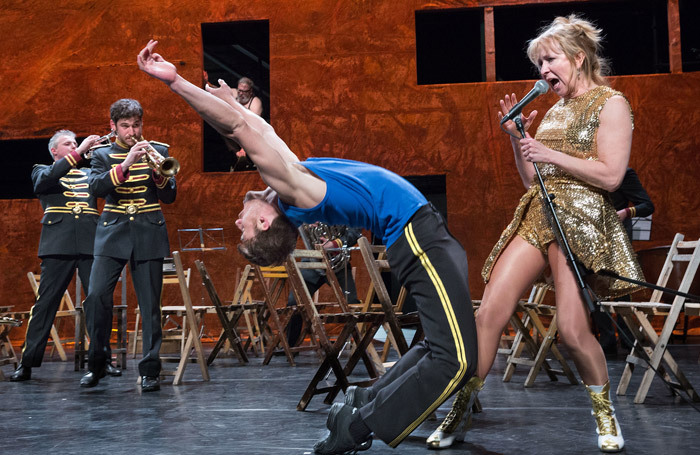 The Heroes Band join the performances at Sadler’s Wells and, along with two gold-sequin-clad marionette-twirling women, a dancer and seven musicians, his beloved marching band becomes an allegory of his life. Despite its tragic subject matter En Avant, Marche! is often hilarious. Opbrouck’s rambling dialogue with the audience, rattled off in a string of languages, ranges from the sad to the crude – often teetering on the point of going too far. Yet on the whole it is delicately tuned, outrageous and touching in equal measure. A choral rendition of a brass-band number – the instruments convincingly mimicked – offers a poignant moment of reminiscence, yet a few minutes later Opbrouck is dancing a tongue-in-cheek pas-de-deux, a duet of unexpected balances and awkward lifts, performed with impeccable comic timing. For all the comedy it’s a stately rendition of I Vow to Thee My Country which draws this cleverly staged work to a close. In trying to come to terms with his own mortality Opbrouck talks of fear, desire and pain without drawing any particular conclusions – and that doesn’t matter. The piece acknowledges that some things are just too difficult to comprehend, but we can face them with courage and, in this case, a large dose of humour.